Never has history "chosen" to eliminate a race of people as in the Spanish Inquisition. One wonders why the silence has remained so steadfast for a people, who brought glory and art to Europe for over nine centuries. When the students of the West open their history books and read the title given to the "Moors", few are ever taught that what they are reading has relevance to "Islam". Today, on architecture frames found in Spain, one can still see the secretive inscriptions in Arabic, written during the days of the Inquisition: "La ghalab illa'illah", "There is no conqueror except Allah." Long after the Inquisition, the resurgence of the Islamic community in Spain occurred in 1976 in the city of Cordoba. Five young men became Muslims through the da'wah of Shaykh Abdalqadir as-Sufi. They were the first Spaniards to enter Islam since the time of al-Andalus. The Shaykh instructed them to spread Islam among their people. Their efforts drew large numbers of new Muslims and the establishment of a Muslim community in the city of Granada. Through the initiative of Shaykh Abdalqadir as-Sufi, the community bought land in the very heart of the old Islamic city, Albaycin, with the intention to build a mosque, the first mosque built by Muslims since the Inquisition. 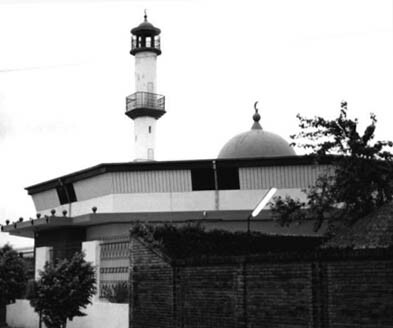 Although their efforts to build the mosque were hindered by public and governmental opposition for 18 years, their project has recently pulled through, and are now a respected community on the brink of establishing a whole Islamic institution. The project consists of not only the establishment of a mosque but an attached school, Islamic college, and da'wah and training center. Regardless of the fact that the Inquisition wiped out almost the entire Muslim community in Spain, a resurgence of Islamic identity traveled from this torn land to the land of another conquest under the same name to Latin America in the 15th century. Slaves, brought by the conquerors from the north and west of Africa, were those who first introduced Islam, newly residing in the countries of Brazil, Venezuela, Columbia and some islands of the Caribbean. These Muslim slaves were obligated to abandon their beliefs under fear of execution, and as a result, Islam disappeared without a trace in Latin America. This trend was reversed at the end of the 16th century, as slaves were liberated. More recently, the community has a new revival with the wave of immigrants from India and Pakistan. Historical documentation shows that from the years 1850 to 1860, a massive migration of Muslim Arabs took place in Latin American soil. The majority of these Muslims came from Syria and Lebanon and planted new roots in Argentina, Brazil, Venezuela, and Colombia. In Paraguay, immigrants also came from Bangladesh and Pakistan. The intensity of Muslim migration to Latin America grew for the next 50 years, which in effect spread to more countries, such as Chile, Peru and Bolivia. These new communities followed the same trend as those who migrated to the US; immigrants became involved in national activities, becoming a part of the community through work, respect and love for the country that received them. Muslim communities then began to gather their strengths as an Ummah and created Islamic centers, mosques and schools. At present, all countries in Latin America have a high concentration of Muslims, large enough to be represented, and comprise both immigrants and natives who have reverted to Islam. The number of Muslims in Latin America is now over six million. The constituent of Argentina is now 700, 000 and Brazil's over 1.5 million. The Islamic Organization of Latin America (IOLA) in Argentina, is the most active organization in Latin America in promoting Islamic affiliated endeavors. Funding from Saudi Arabia has allowed them to build a large traditionally aesthetic mosques, as well as a community center. The IOLA holds events to promote the unification of Muslims living in Latin America, as well as the propagation of Islam. In March of this year, IOLA's Office of Culture and Islamic Diffusion sent 13 young Muslims from Argentina, Chile, Brazil, Uruguay, Bolivia, Paraguay, Venezuela, Margarita Island, Curazao, Guatemala, Costa Rica and Ecuador to Hajj. In February, the Secretary General of the Muslim World League invited the Director of IOLA to speak at a seminar in Rome, entitled "Human Rights in Islam". Held at the Center of Islamic Culture of Italy, IOLA's Director, Muhammad Hallar, spoke objectively on the principles of human rights in Islam in its universality and uncovered the truths smothered by false stereotypes in the West to an audience of foreign officials of other faiths. Hallar also conferred with the Muslim organizations of Latin America, specifically of Argentina, Brazil and others in the United States. As the new generations of Muslim immigrants grow in Latin America, their affiliation with their countries' needs is never compromised, while establishing their Muslim identity. In Peru, Muslims have become aware of their country's orphan problem. With this in mind, Latin American Muslim Unity (LAMU) has drawn a proposal for the first Islamic orphanage in Peru, in order to deal with the current crises of a multitude of homeless children, who are victims of kidnapping for organ harvesting and purchasing, and mass assassinations by police squads. In Mexico, the Centro Cultural Islamico de Mexico (CCIM), is both a mosque and center for da'wah. Da'wah, being its main objective next to being a religious center, CCIM is active in obtaining and translating books and Islamic texts into Spanish and has produced 13 publications, as well as run a radio program on Islam. Its small mosque pushes forth-great efforts and is home to 150 new shahadas in the Mexican community since its inception in 1994. Although a great Muslim history is becoming more prevalent in Latin America, a surge of Latino reversion and Islamic activism in the United States has been astonishing, a phenomenon covered in the American media in recent years. Due to the United States' reigning minority of Latinos, the constituents' activities in general are monitored closely. News stories of Latino reversions to Islam have been covered in major publications such as the Los Angeles Times and The Christian Science Monitor, as well as in public television news programming. In 1997, the estimated number of Latino Muslims in the US was approximately 15, 000 according to the American Muslim Council in Washington DC. As the wave of Latino reversions increased intensely, a new poll is being taken this year, which will exceed this number by far. Having one of the largest Latino Muslim communities, Los Angeles is home to the ILM Foundation, which runs a series of Islamic classes in the Spanish language. The ILM was started by a group called the Latino-Muslim Movement. Some of the highest concentrations of Latino reversions have been in New York, New Jersey, Chicago and Miami. In New York, a group of Puerto Rican Muslims opened an Islamic center in the heart of East Harlem called Alianza Islamica, where hundreds of Latinos have reverted since 1992. The center, the first of its kind, includes a small mosque, where the Friday khutbah is heard in Arabic, English and Spanish. PIEDAD (Propagacion Islamica para la Educacion e la Devocion a Ala' el Divino), originated in Washington DC, is a Latin Muslim Women's Association, which deals with the counseling of Muslim women, as well as da'wah geared towards non-Muslim Spanish-speaking women. PIEDAD has also worked in collaborative da'wah efforts with the NIPA (National Islamic Prison Association). All Latino Muslim entities across the United States are affiliated with the endeavors towards da'wah material in the Spanish language, which includes both translation and dispersal. Some others include Asociacion Latina de Musulmanes en las Americas (Latin Association of Muslims in America) of California; The Latino American Da'wah Organization of New York; Sociedad de Musulmanes Latinoamericanos (Latin American Muslims Society) of Washington DC; Bism Rabbik Foundation of Florida; and Centro Isl�mico de Traducci�n e Informaci�n (Islamic Center of Translation and Information) of New Jersey. There are currently two different published translations of the Quran in the Spanish language. The Islamic Society of North America (ISNA), holding some of the largest annual conferences in the United States, is the first to present a "Conference on Islam among the Latino Americans", to be held on June 30 to July 2, 2000. The wave of reversions to Islam by the Latino-community has a different significance to each individual shahadah. Some Latin Muslims find it is a return to the ancestry of their Moorish blood. Others find the concept of freedom of race identification one of Islam's assets, while others find solace in the religion from the confines and inauthenticity of their culture's tradition of Catholicism. The Los Angeles Times interviewed Reymundo Nur and Saadiq Saafir, leaders of the Latin Muslim community, at the ILM Foundation. " 'We all realize that we're Muslim first,' Saafir said. 'This religion is going to bring us together.' Nur nodded. 'Inshallah,' he whispered. 'God willing.'"